Biography Ismail Marzuki and Profile Struggling through a piece of music with his work for the country and Indonesia, to better understand and know that Ismail Marzuki iapa here's his bio may be useful and pleasing increase knowledge About Biography Indonesian heroes and to pray that God megenal services received good deeds and put them on his side. 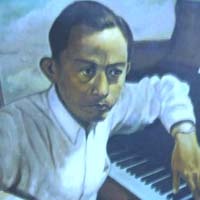 Ismail Marzuki started writing songs began in 1931 with the first track titled O Sarinah depicting the life of an oppressed nation. After about 250 songs that he managed to create in the period 1930-1950. His songs have a variety of themes and genres of music. Dozens of Ismail Marzuki song was re-released by top artists up to now. Ismail Marzuki renowned expertise in making a simple song, but having a strong poetic and melodic and timeless. Title of the music maestro Indonesia deserves bears.